Play Super 5™ online for free now! 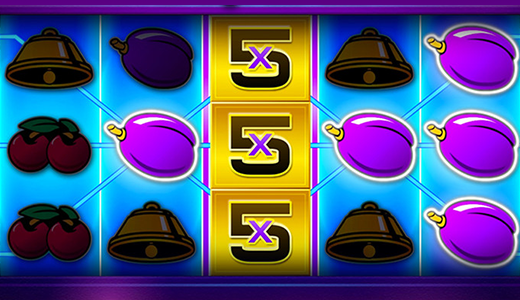 In Super 5™ you play on 5 reels as well as 5 win lines that stretch across the reels as winning patterns. The most valuable symbol in this slot is the Star. 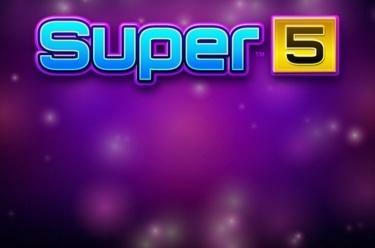 Your aim in Super 5™ is to line up at least 3 identical symbols along one of the 5 win lines. The 5 symbol (Wild) only appears on reel 3 and automatically covers all positions of the reel. If that's the case it can substitute for all other symbols. The 5 symbol (Wild) only shows up on reel 3! If it appears it covers the entire reel. Moreover, it multiplies your winnings x5 if it is part of a winning combo and substitutes for other symbols. If it does not substitute for other symbols it grants your current total bet x 2. Everyone loves fruits but did you know that the fruits in our slot Super 5™ also have a secret passion? They really do: They long for the 5 symbol that acts as Wild here and can cover the entire third reel and multiply the value of your winning combo by 5. Even if the 5 symbol is not part of a winning combo you win double the total bet if it lands. All good things come in fives! Gaming should be fun and nothing else. This is why you can only play with the virtual game currency 'Twists'. Fun should always be the most important aspect of your gaming. It doesn't matter whether you play online or in the casino, never play to make a 'quick buck' or if you cannot afford it. If you are concerned about the gaming habits of another person please contact GamCare or GamblersAnonymous.